With research showing that 70% of people treat their pets as they would a child, it's little wonder the sector is defying the recession. Anthropomorphism is a way of life for many pet owners and the pet-food industry has also taken it to heart, as product claims increasingly mimic those seen in the general food sector. Functional health, convenience and indulgence are all product benefits appearing on pet food as the sector rides the recession better than most. 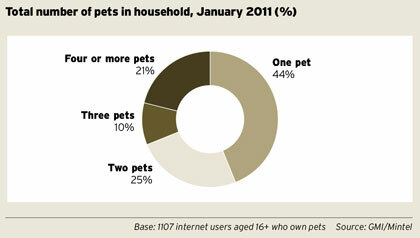 The role of the pet has been elevated in many households, according to research by GMI. Seventy per cent treat their pets with as much care as they would a child and 87% consider their pet to be part of the family. However, some pets come off better than others. A survey commissioned by the RSPCA for Rabbit Awareness Week found that rabbits are one of the least understood pets and as a result owners are being unknowingly cruel. They are kept in cramped conditions and fed the wrong food by many owners, who do not realise they need space to run around. The GMI research found 7% of pet owners keep a rabbit. 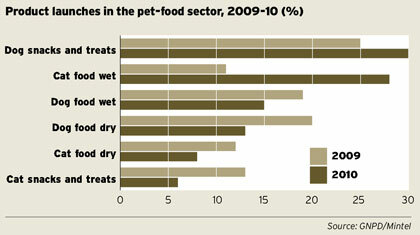 The pet-care market (including food, healthcare and accessories) was worth £2.6bn in 2010 and grew 5% between 2009 and 2010. Pet food accounted for £2.1bn of this. Cats and dogs dominate the sector, but over the past five years the number of households with dogs overtook those with cats. However, as cat owners are more likely to have more than one feline in their household, there is a greater cat population. 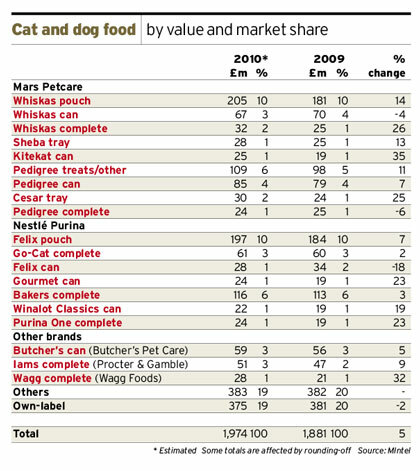 In 2010 there were 8.6m cats compared with 8.3m dogs, according to the Pet Food Manufacturers Association. There are some significant differences between the cat- and dog-food markets: wet food dominates cat food (74%) while dry food (45%) outsells wet (31%) in dog food. The two areas that have experienced the biggest growth have been single-serve cat food and cat and dog snacks and treats. The popularity of single-serve may be a consequence of the rise in pet obesity as it helps owners better control portion size. Some experts estimate that a third of dogs and a quarter of cats are overweight. This brings the same associated health problems as it does in obese people, such as heart disease and diabetes. This is thought to be because of overfeeding rather than a lack of exercise. The trend for dogs and cats to be treated as one of the family is evident in products such as the Tesco Finest options for animals, the packaging of which is remarkably similar to the human versions. Pet accessories also make up part of this sector with toys the most popular purchase. While cat owners tend to need fewer accessories, dog owners buy more – 68% of the latter buy toys compared with 51% of cat owners. Brands have succeeded in adding value through packaging updates, more benefits, sustainability claims, life-stage appropriate foods and nutritional treats. However, constant innovation is needed to sustain this growth, while there is also a constant backdrop of pressure on prices given the economic climate. 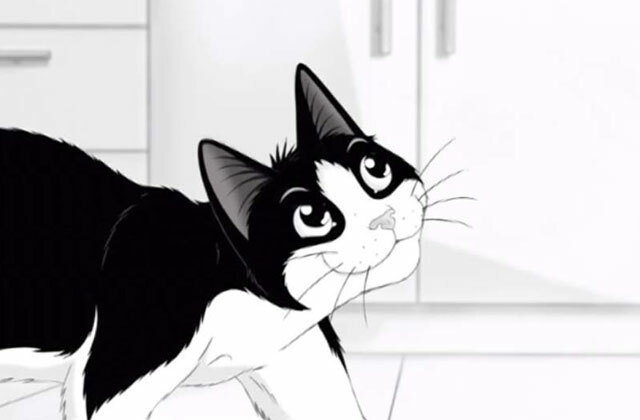 Leading manufacturers in this category are Mars Petcare, the owner of the Whiskas, Pedigree, Sheba and Cesar brands and Nestlé Purina, which has the Felix, Go Cat, Winalot and Bakers Complete brands. Other brands include Butcher’s, Procter & Gamble’s Iams and Wagg. Nestlé Purina and Mars Petcare have invested in their online activity, with the intention that their websites become an educational tool as well as a communication medium. As the cost of living continues to rise, the idea that the pet industry is recession-proof may be tested to the full. The success of value brand Wagg shows pet owners will trade down when they have to. However, Mintel predicts that in the next five years the market will grow by 8% to reach £2.9bn.